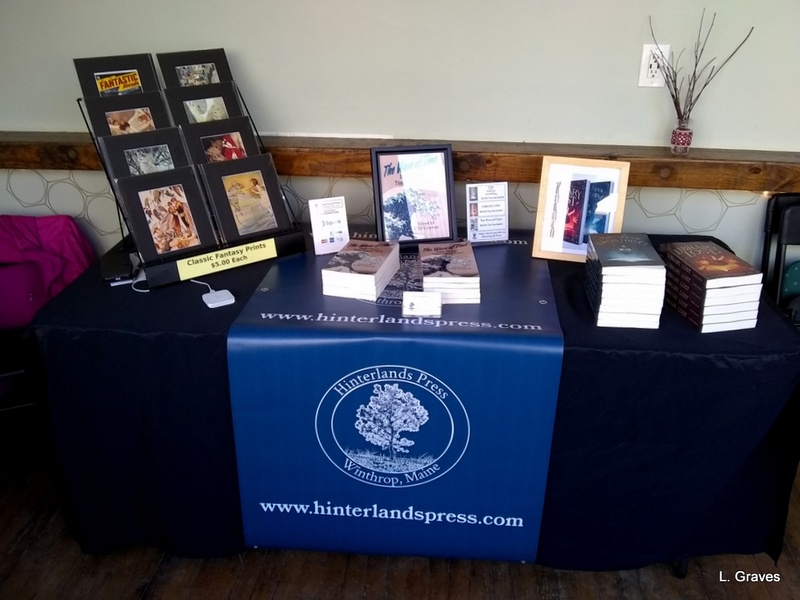 Yesterday, we took our books and illustrations to Bear Bones Beer in Lewiston, Maine. It was part of a pop-up event sponsored by the Sunday Indie Market. While we didn’t sell many books—it was a fairly quiet January Sunday at Bear Bones—we had one heck of a good time. 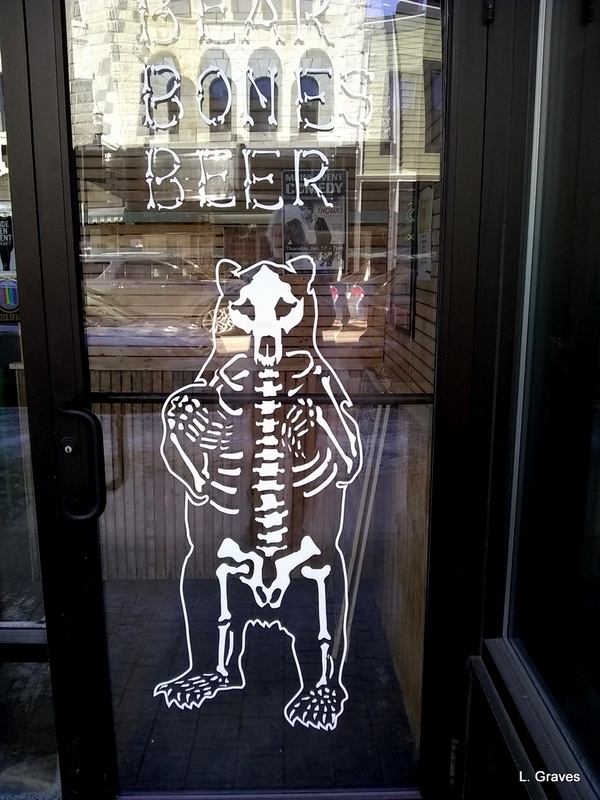 First of all, Bear Bones is such a warm, inviting place to gather, whether you’re a beer drinker or not. There are wooden tables with chairs scattered here and there as well as comfortable chairs in front of a gas fireplace. (Alas, we did not take more pictures of the charming interior. What were we thinking?) In short, Bear Bones has a great vibe, a place to come on a cold day, to meet people and talk. And talk we did, mostly with the other delightful vendors. We were lucky enough to be next Nate and Megan Chasse of Sweet & Savory Bakehouse. My oh my, what good bakers they are! 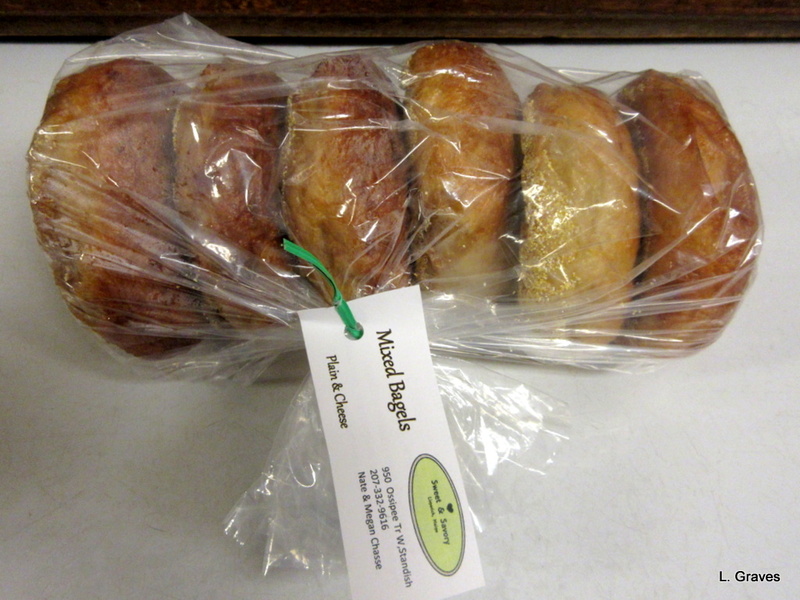 Nate generously gave us a bag of mixed bagels, which we had with soup when we got home. Their bagels taste tangier than most bagels, and Clif and I had to be firm with ourselves and stop with just one each. We learned that Nate went to culinary school and that he and Megan are able to support themselves with the proceeds from their bakery. Go team, Chasse! I also had some time to sit in a comfy chair by the fireplace. I chatted with Sheri Withers Hollenbeck, one of the organizers of the Sunday Indie Market in Lewiston, and her mother, Bonita. So lovely to get to know them. 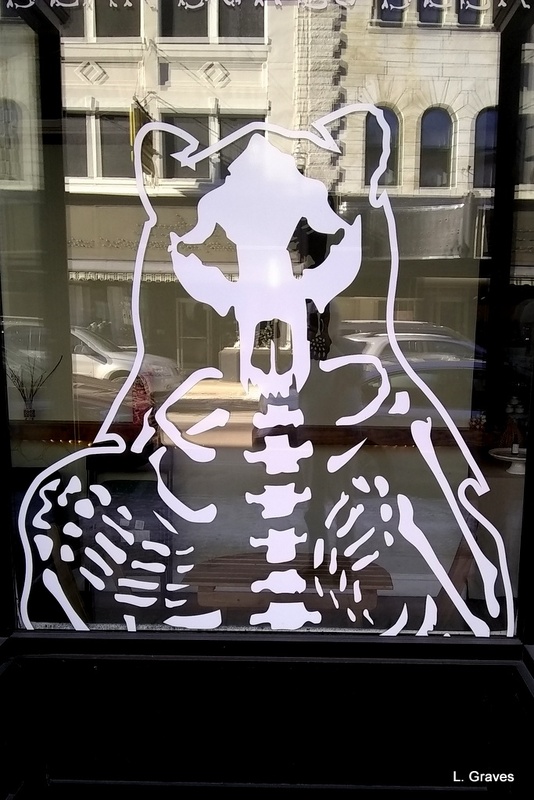 Food is not served at Bear Bones, but customers are allowed to bring in their own from other places. In a table not from where we were set up, a man brought in a whole cheese cake, which he shared with Nate and Megan and Clif and me. He even provided plates and spoons for us. It’s that kind of place. 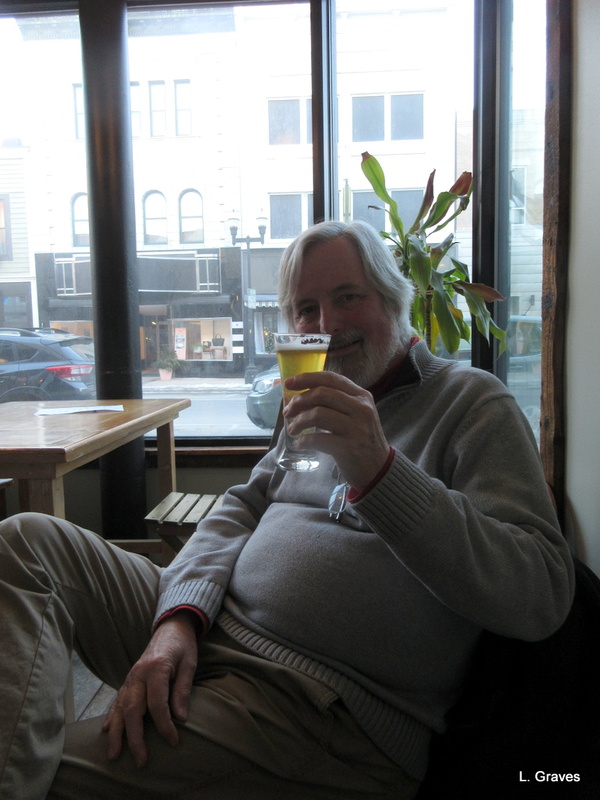 When our stint was over, Clif got a baby beer—a $3 hobbit-sized glass of the Bear Bones IPA. A nice way to end the day. Readers, if you live in the Lewiston area and want a warm place to go on a cold winter’s day, head to Bear Bones Beer. They also host events such as trivia nights and open mics, so check out their events page before you go. On Saturday, Clif and I had a pop-up table at Quiet City Books in Lewiston. 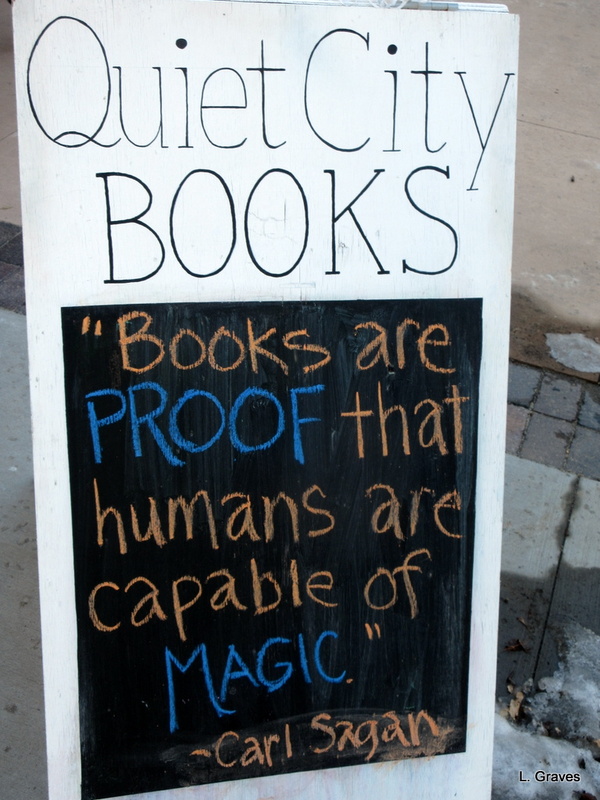 Quiet City is surely one of the best little bookstores in Maine, with a wonderful selection of books and gifts for readers of all ages. 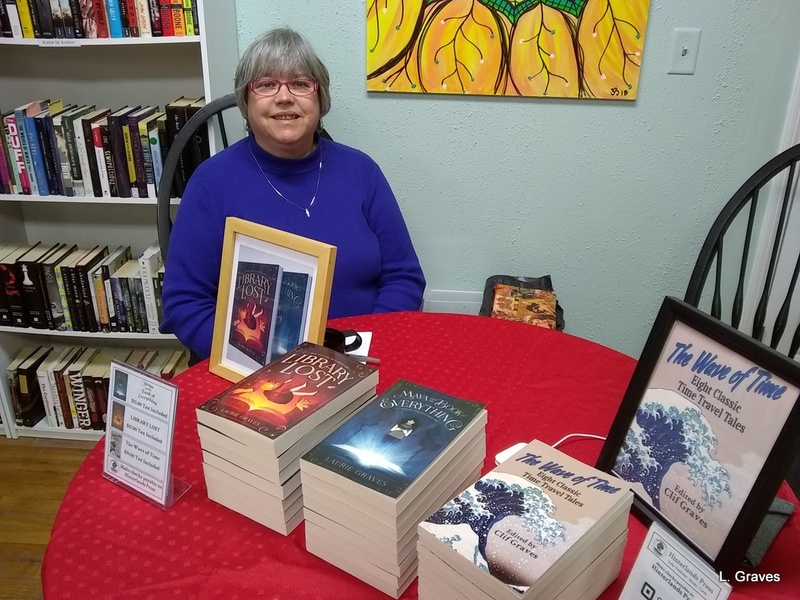 We were at the bookstore as part of an event called Sparkle Saturday, where the many stores and restaurants on Lisbon street opened their doors to welcome crafters and artists to set up tables. 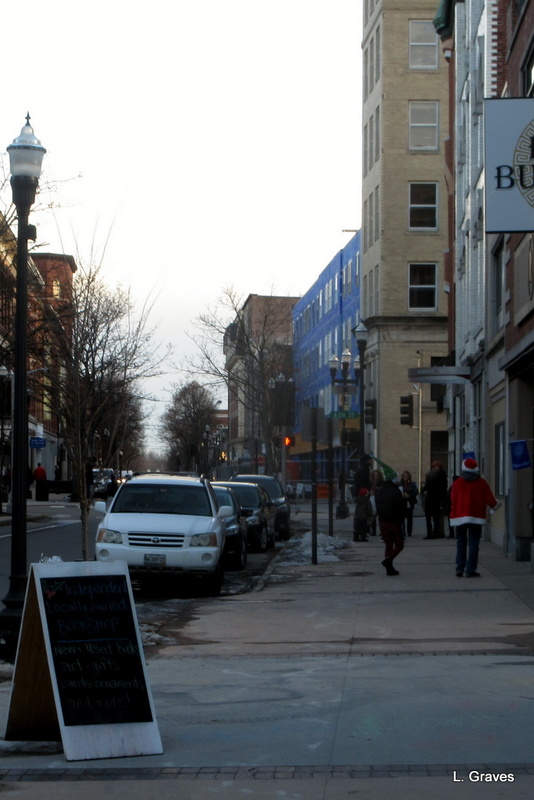 The goal was to encourage people to come downtown and shop locally. If our experience was any indication, then I would have to say that Sparkle Saturday was a smashing success. Truly, we had our best day ever at a single event. How fun it was to watch people come into the bookstore, browse, stop at our table, buy books, and then head to the front counter with another armload of books to purchase from Courtney, the owner. Oh, the heart of this nerdy, wordy book girl was filled with joy. Readers, I know I am preaching to the choir, but I want to emphasize how much it means to writers, crafters, artists, and local businesses when people buy their wares. Most of us have budgets as big as a minute, and it is a huge boost to have a day like Sparkle Saturday, where shoppers are out and about, planning to buy presents from someplace other than a big box store. 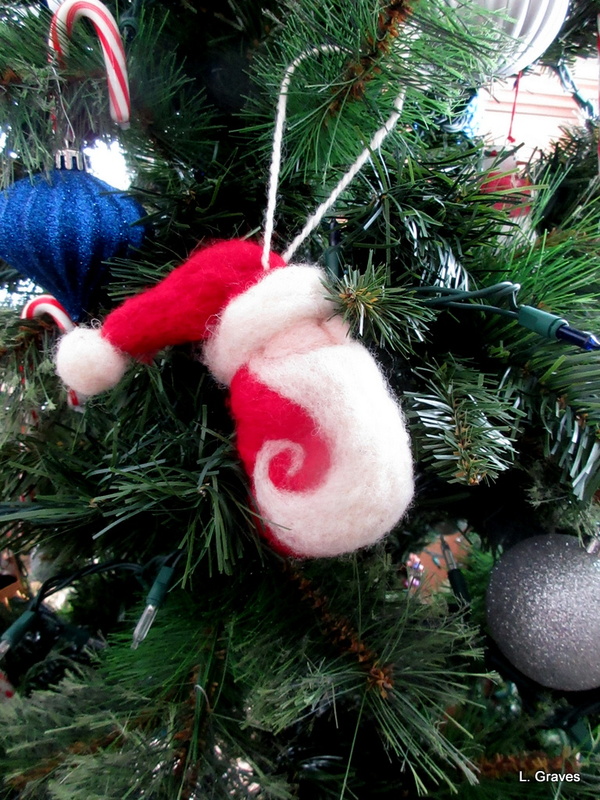 I got into the holiday spirit and bought an adorable felt Santa ornament from Maureen Andrew from Warm as Wool. Maureen was also a vendor at Quiet City Books. 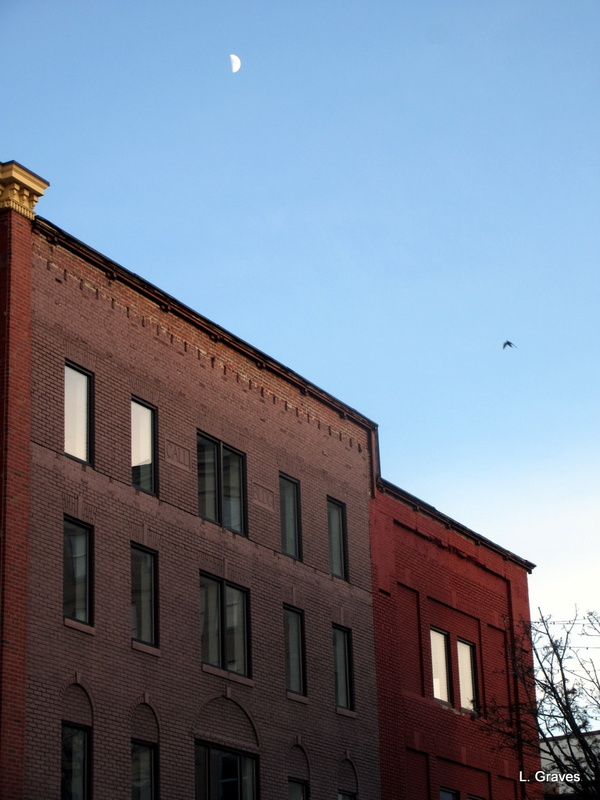 Finally, here is a shot of dusk in Lewiston as the moon rises over a building, casting a soft light on everything, bringing good cheer and hope to a small city that is still struggling but is beginning to find its way. 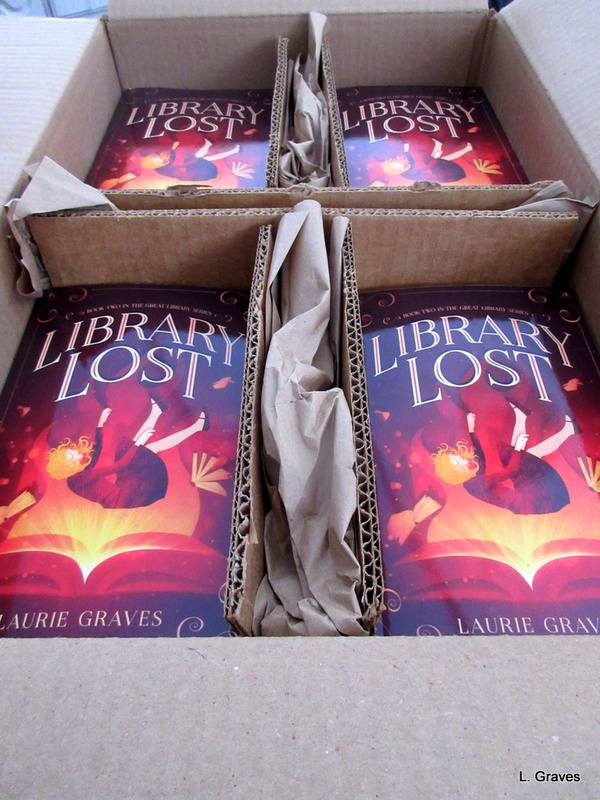 Look What Came on a Snowy Day: Library Lost! The books have arrived! Library Lost, the sequel to Maya and the Book of Everything, is now available. What a thrill to see them, so vibrant and red, in the box. 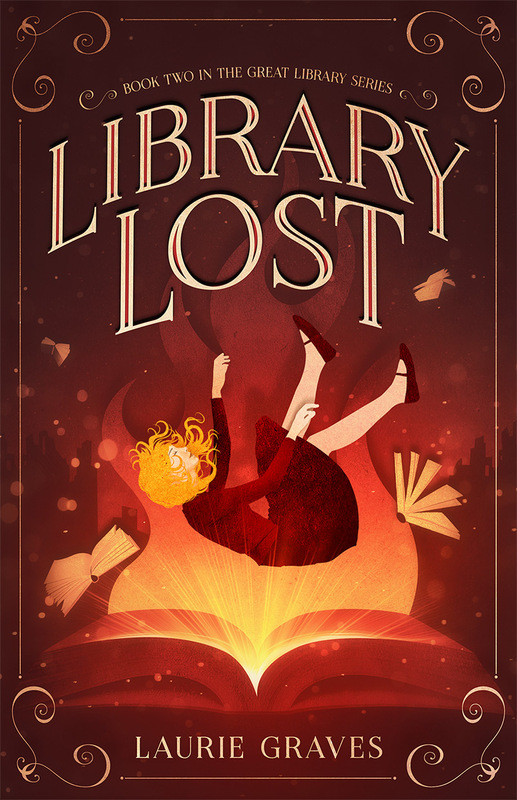 Library Lost is the second book in my Great Library Series. Two forces, Time and Chaos, battle each other for control of the mysterious Great Library, where all information flows. In the middle of this battle between Time and Chaos is one kid from Earth—Maya Hammond, who has traveled back in time, across the universe, and then home again with a Book of Everything from the Great Library. 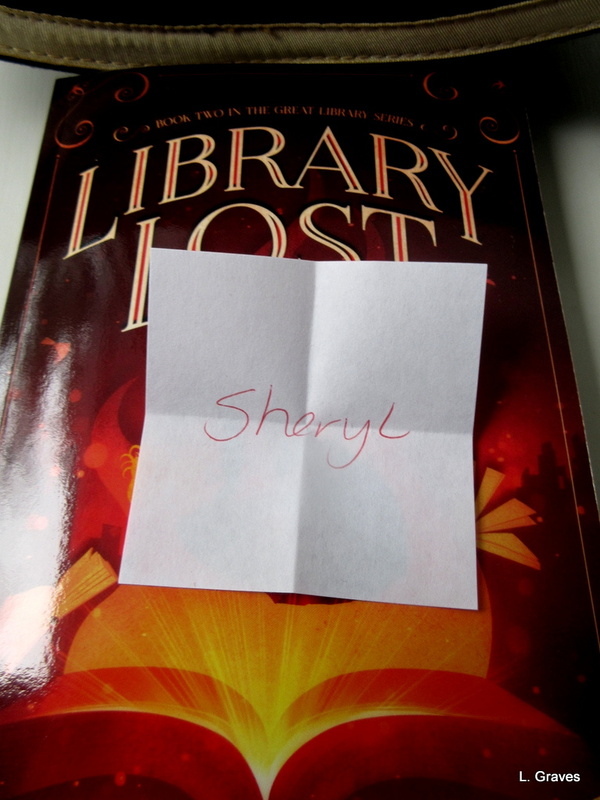 In Library Lost, Maya is once again on the move, this time with an Apprentice Book named Ariel. As Chaos gains an edge, it doesn’t take long for the action to spiral into mayhem and destruction. However, Sydda, the Great Library’s director, has come up with a daring but dangerous plan that involves Maya. But Maya has grave doubts. How can she ever prevail against such a powerful force as Chaos? How, indeed? Library Lost can be ordered directly from Hinterlands Press. For orders in the United States, shipping is free, and you can get your very own signed copy of any of our books. We are also having a holiday sale: Order both Maya and the Book of Everything and Library Lost for $28, and again, shipping is free. For those who like or need to order through Amazon, here are two special offers. Through the end of December, the Kindle version of Maya and the Book of Everything will be available for $0.99. And here is an even better deal: If you buy the paperback edition of Maya and the Book of Everything, the Kindle version is free. My husband, Clif, and I will also be attending several fairs in Maine between now and Christmas. Central Maine readers, all you need to do is click the events button at the top of our Hinterlands website to see where we will be. A heartfelt thanks to the many blogging friends who not only bought Maya and the Book of Everything but also took the time to write thoughtful reviews on their own blogs. I so appreciate this. 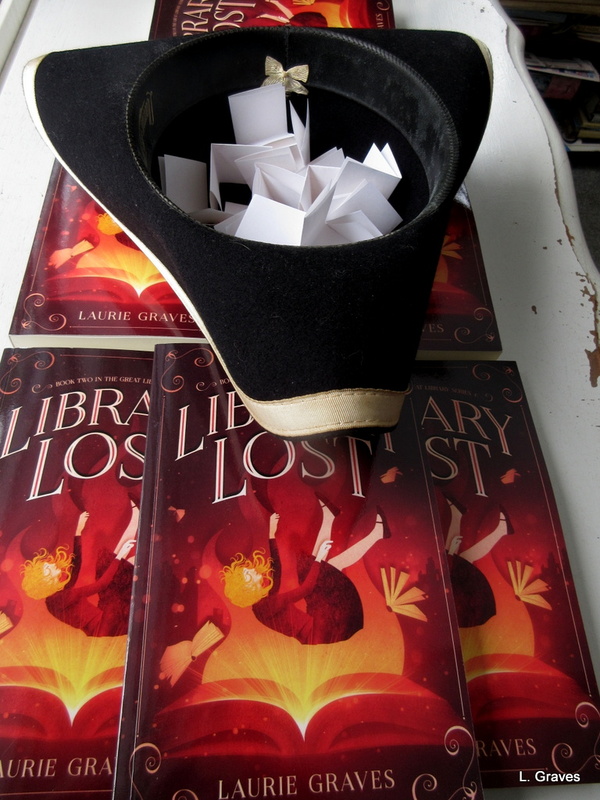 A reminder: The drawing for the free copy of Library Lost will be held on Thursday, November 29. There are still a couple of days to enter the contest, and I will mail the book anywhere on this planet. Anywhere. Finally, the credo of the Great Library Series can be summed up in three words: Love Your Library. But, blogging friends, you already love your libraries, don’t you? Before I get to the really fun part of this post, a bit of news first. The nor’easter proved to be pretty mild, as such things go. I think it went mostly out to sea. By the Maine coast there were strong winds, but as far as I know, there were no widespread power outages. There was hardly any wind in our area, but there was some slushy snow that made driving a bit tricky. But glory be, we kept our power. That’s one storm down and who knows how many more to come. With our books, we went to two fairs this weekend, and the one on Saturday was nearby at Hall-Dale High School. We had a good time and sold quite a few books, but the best part of the day didn’t involve any sales at all. The librarian from Monmouth Middle School stopped by to tell me something that all writers of young adult fiction long to hear. Oh, my gosh! I was so thrilled when she told me this that I stammered out my gratitude in an inarticulate way. But she made my day, that’s for sure. Now we come to the fun part of this post. I am barreling down the homestretch with editing Library Lost, and it will be ready to go out into the world in two or three weeks. To celebrate this second book in the Great Library Series, Clif and I are having a contest to give away a signed copy of Library Lost. And readers, we will mail the winning copy to Canada. We will mail the winning copy to England. We will mail the winning copy to Australia. In short, we will mail the book to the winner anywhere in the world. So don’t be shy about entering the contest. We are thrilled to be offering this give-away. All you have to do is tell me in the comment section that you would like to enter the contest. The winning name will be drawn on November 29. All right. The first proof copy of Library Lost has been edited, and a second proof copy is on its way, with an expected delivery of next week. Normally, this would be a chance for me to catch my breath and maybe get some much-needed household chores done. But…we have two fairs this weekend, and, just to add a merry touch, a nor’easter is blowing up the East Coast. Will the fairs be canceled? And, our perennial question, will we lose our power? Stay tuned! 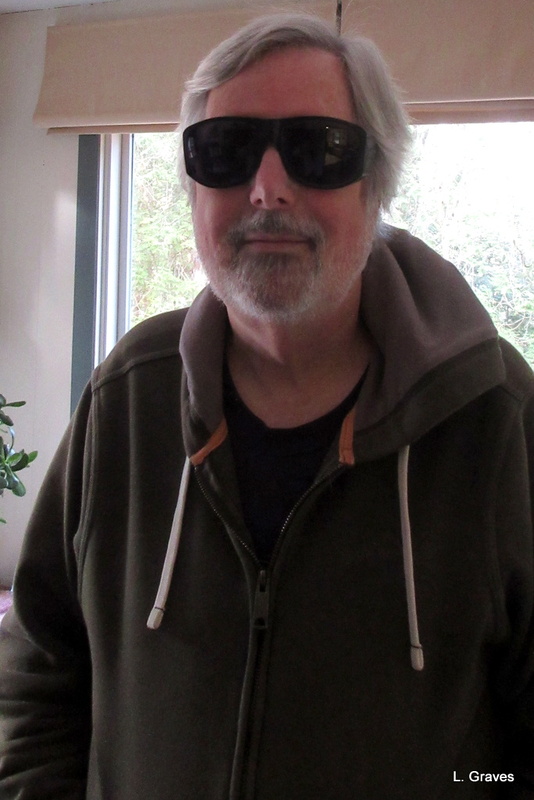 Last week, Clif had a cataract removed, and the procedure was a huge success. His vision is greatly improved, and he hardly has any restrictions on what he can lift. But I promised you a funny story about his cataracts, and here it is. First, we must have a picture of Clif wearing what he has dubbed his “glasses of shame,” which loudly proclaim cataract surgery and old codger satus. The gray hair, of course, just adds to it. Even with a procedure as minimally invasive as a cataract removal, fasting is necessary. An upset stomach during the procedure would be a Very Bad Thing. Clif’s surgery was just past noon, and by the time he had sufficiently recovered, it was about 2:30 or 3:00. Even though Clif was woozy from the sedatives he had been given, he was hungry. Extremely hungry. “Do you want to go there?” I asked Clif. “Yes,” came the prompt reply. Thus one of our guilty pleasures is revealed—we both have a soft spot for Kentucky Fried Chicken. A leftover from our youthful days, I suppose. We hardly ever eat there, but when we do, we enjoy it. The nurse helped a wobbly Clif to the car, and off I drove. At KFC, there was, of course, no nurse to help Clif. There was just me, significantly shorter than Clif and with creaky knees to boot. In we toddled—a woozy Clif with his glasses of shame and me doing my best to hold a steady course. I can only imagine what we looked like. Because we hardly ever go to KFC, we had no idea what the various meals included. Swaying slightly, we studied the large menu sign on the wall behind the counter. Finally I asked the woman who was patiently waiting for our order about what sides came with one of the Big Box Meals. And so we did, saving ourselves about $10. We each had two pieces of perfectly cooked chicken, a surprisingly light biscuit, hot mashed potatoes with gravy (yes, they were instant), and cole slaw. As we ate, we giggled about being urged to order the senior citizen special. This is a first for us as usually we have to ask for it. But I suppose we looked like a pair who was in desperate need of a good deal. Everyone once in a while, there is a benefit to being gray haired and wobbly.